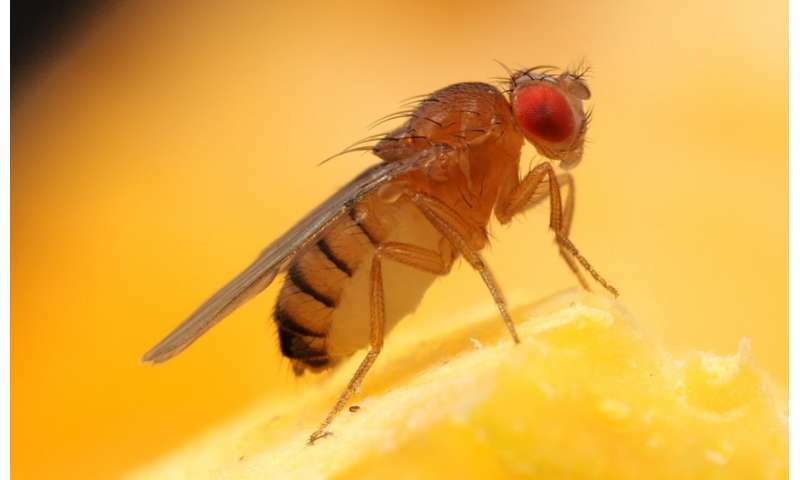 A new doctoral thesis from Lund University in Sweden shows how fruit flies use their sense of smell and humidity to find food, avoid dehydration and discover the best place to lay their eggs—in overripe marula fruits. Faeces from herbivores are also suitable, but the flies reject carnivore excrement. Summer is high season for tiny fruit flies (Drosophila melanogaster). Overripe fruit is their favourite haunt, and if the fruit is in a relatively humid location, the fruit flies like it even more. On Friday 1 June, Suzan Mansourian will publicly defend her thesis Drosophila sensory neuroethology, in which she examined fruit fly behaviour and the nerves and neural pathways that govern this seemingly simple organism. Together with colleagues, Suzan Mansourian investigated and mapped the receptors on the fruit fly's antennae, which it uses to locate food, humidity, reproductive partners, and a good place to lay its eggs. Some receptors detect fragrance molecules from the fermentation process in rotting fruit—a fragrance that signifies food for the fruit fly. Other receptors react to the smell of phenol, which is released by the pathogenic bacteria in the excrement of predators. When the fruit fly identifies the smell of phenol, it avoids laying its eggs in the location, as it is a dangerous place for the larvae. Mansourian made the discovery in connection with fieldwork in Africa. Her results show that fruit flies shun the excrement of lions, but have no objections to laying their eggs in giraffe faeces. In her thesis, she also describes the fruit fly's humidity receptors, located behind the antennae. These receptors function like a sixth sense for the fruit fly, helping it to find environments where it can avoid dehydration. These humidity receptors enable the fruit fly to find its way into kitchens, for example, where the humidity in the air is usually relatively high, around 70 per cent. Although the fruit fly is a generalist and manages to survive well in widely diverse environments, Suzan Mansourian reveals that it thrives best of all in the vicinity of overripe marula fruits, which are plentiful for parts of the year in the whole of southern Africa. Her conclusion is that marula is the original host plant of the fruit fly. The findings in the thesis increase knowledge of the fruit fly's senses of smell and humidity, as well as their underlying mechanisms. "These results could lead to new approaches and strategies in combating mosquitoes and insect pests", says Suzan Mansourian.